Our First Saturday went off without a hitch and here’s the photo to prove it! I ran up to join this Nirvana dance party several moments later, but fortunately, I seem to have avoided infamy for now. 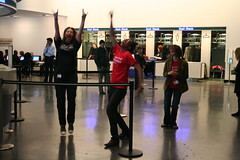 There’s also a great video of this on the Brooklyn Museum’s flickr photo stream. This entry was posted in Art, Brooklyn, Uncategorized and tagged Uncategorized. Bookmark the permalink. thanks for posting my pic, and for dancing! Andrew Andrew rocked the house.